How do you build confidence and overcome nervousness? If you already have a strategy or plan of attack for your role-play, you have a foundation on which to build your specific ideas and plans for the role-play problem. This takes a lot of the stress out of preparing a role-play, since a lot of it is already put together before you get there. It helps to know everything you can ahead of time, because it saves you time in trying to figure out if you’ve covered everything thoroughly. Also, brainstorm a pet idea. For example, since my strength was promotion and personal selling, I tried to tie in a promotional or personal selling component to every role-play, which gave it a unique twist that may have been beyond the expectations of the judge for that particular role-play. It also brought me to the well-worn and familiar territory of something I was good at. Earning the opportunity to compete means that you have the skill and talent to succeed, and that you have the ability to do a great job. Just be confident in yourself and the rest will follow. 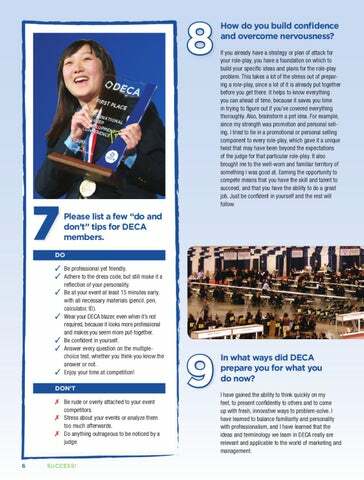 Please list a few “do and don’t” tips for DECA members. reflection of your personality. Be at your event at least 15 minutes early, with all necessary materials (pencil, pen, calculator, ID). Wear your DECA blazer, even when it’s not required, because it looks more professional and makes you seem more put-together. Be confident in yourself. Answer every question on the multiplechoice test, whether you think you know the answer or not. Enjoy your time at competition! 7	Be rude or overly attached to your event competitors. 7	Stress about your events or analyze them too much afterwards. 7	Do anything outrageous to be noticed by a judge. In what ways did DECA prepare you for what you do now? I have gained the ability to think quickly on my feet, to present confidently to others and to come up with fresh, innovative ways to problem-solve. 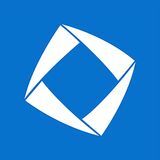 I have learned to balance familiarity and personality with professionalism, and I have learned that the ideas and terminology we learn in DECA really are relevant and applicable to the world of marketing and management.